Rebecca J.: Friday it’s off to the Surfside roofdeck for margs, chips n’ queso and tacos. Afterwards, I’ll be sipping some bourbon at Kitchen 2404 in Glover Park. Saturday I’m headed to Annapolis for an afternoon boat ride on the bay and dinner at the waterfront, after which I’ll be hitting up the Annapolis bar scene with my lady friends. Hopefully, I’ll leave Annapolis early enough to miss the traffic back to DC and in time to grab a Rita’s Italian Ice on my way back. Tom: Tonight we’ll kick off the weekend with a neighborhood Happy Hour at San Antonio in Brookland, getting some time to hang out with my neighbors and get to know faces to go with email addresses on the neighborhood listserve. Friday night there’s always Baseball on the Barn. 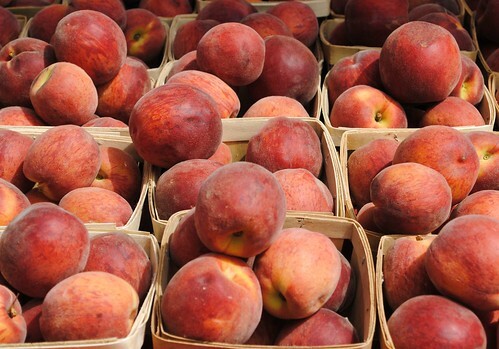 Saturday I intend to enjoy the delicious weekendness of it all, with a trip to the Bloomingdale Farmers’ Market, before DJ lil’e hits the stage at 9:30 club. Sunday is (possibly) Strasburg’s first start at Hagerstown, so we’re trekking on up to see the Suns. Looks like a good weekend! Brian M.: For a variety of reasons, I didn’t get a chance to do what I had planned last weekend. So let’s just say I’m glad Saturdays and Sundays come around every week. However, I also have some alternate plans for this weekend. 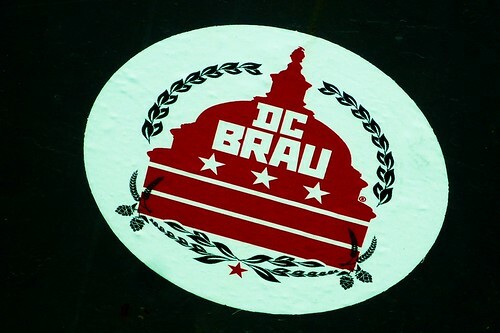 I’m looking into possibly going to the DC Brau brewery for one of their Saturday tours. As for Sunday, my inner 10 year old is telling me to go see The Last Starfighter at the AFI in Silver Spring. Why? Because I’m a sucker for bad ’80s movies, and the best movies I’ve seen this year have been old ones at the AFI (the original Tron and Blade Runner). Don: Having cowered in my home hiding from the heat last weekend I’m looking forward to actually going somewhere this weekend even if this one looks like it’s gonna be pretty sucky too. We’ve got to run an errand down in Maryland to what my Darling Wife insists it is inappropriate to call the western shore. Since nothing says road trip like a kitchy stop we’ll stick our head in theTiki Bar of Solomon’s Island. Despite the fact that it is not the Tiki Tiki Tiki Tiki Tiki Roomand that it looks like it’s on a peninsula, not an island, it sounds right up my alley. By which I mean tacky and with alcohol. Once we’re back we may catch a showing of Oklahoma! since my better half hasn’t seen it yet and there’s some good deals to be had. Marissa: This weekend is all about juggling work and play. Saturday night I’m headed out to Clyde’s Willow Creek Farm for a slow food dinner that I couldn’t be more excited for (hopefully some drool-worthy pictures will result…). Then Sunday, weather permitting, I’ll be kayaking with some friends on the Potomac near the Thompson Boat Center. And before I launch head first into another busy week, I’ll chill out with some yoga at Stroga. Their “Flow for a Cause” class on Sundays at 6:30 benefits Joseph’s House. Jenn: Ah, shopping. 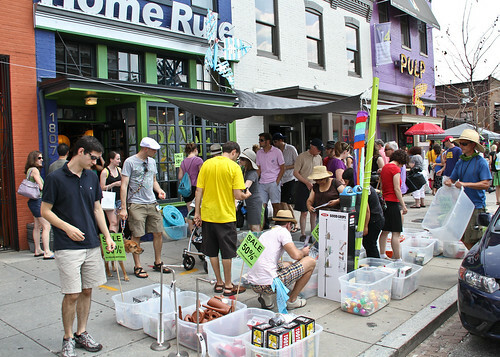 This weekend sees one of my favorite neighborhood events, the MidCity Dog Days of August Sidewalk Sale. 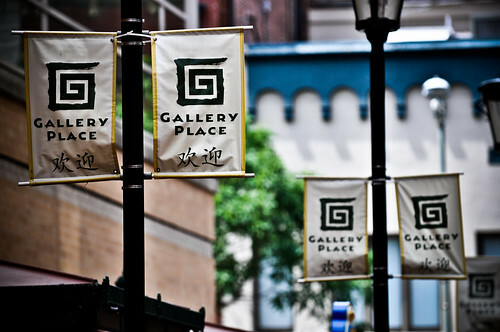 Stroll around the U and 14th Street corridor both Saturday and Sunday for great deals at shops like Current Boutique, Miss Pixie’s, Treasury and more. Restaurants will also be in the mix, with sangria at Vinoteca and Cork Market serving up lemonade. Studio Theater gets into the game as well with its annual costume and prop sale. Dog Days is in its 12th year, which makes me so proud as a local resident. Sunday also sees more fun shopping to choose from with creative art market Marcatus over at the Yards Park, featuring artists, fashion and food tents with live music. Even if the weather doesn’t agree, I’m counting on having an enjoyable time! Moses: Day 3 of my vegetarian diet leads me to Regent Thai tonight for my favorite red curry in DC — in tofu this time. Exodus from the city takes me across the river (via bridge this time) out west with friends and dogs to Hot Tub Heaven cabins at Shenandoah, for hiking and canoeing followed by wine tastings at Barrel Oak Winery (BOW) now open until 9pm on Friday and Saturday! Post-hike soak in the hot tub to cool down, followed by vegetarian “dinner” of ValSotillo Crianza from Ribera del Duero, Spain and manchego cheese. Sunday re-integration to the city sweating with my neighbors on the L’Enfant patio, watching the construction equipment sit silently idle on 18th Street. Rachel: Well, it appears I won another Sign of the Whale Happy Hour for Friday night. I’m still debating about whether or not I want to redeem it but it’s likely that I will. Saturday will be spent running to Tenleytown’s Ace Hardware and Container Store for some items I need to spruce up my studio apartment. If it’s nice out, I’ll stop for a smoothie at Robecks (always a good choice). I’d like to follow that up with a trip to Chinatown to see Rise of the Planet of the Apes or Cowboys and Aliens. What can I say — I’ve got a thing for bad Sci-Fi flicks. They’re both playing at the Regal Gallery Place theater so I’ve either got to make up my mind or sit through a double-feature. Might stop off for a pint of Harp at Fado afterward since they have it on tap. Then, I’m hoping to round out the weekend with some Sunday brunching at Chef Geoff’s and bit of home maintenance. It’ll be my first Sunday since April without a game to play at Stoddert Field, so I’ll be mourning that as well since the GPCSL season is now finished. Tiff: Drinks with our fellow Brooklanders at San Antonio Grill on Thursday, birthday drinks with a friend on Friday… by Saturday morning I’ll be ready for some clean living, and a trip to the CSA farm to pick up our share. I’m still low-car dieting, though, so most of the rest of my weekend’s entertainment will have to be transit-accessible. Movie at Gallery Place? Brunch at Eastern Market? This not having to park thing is pretty liberating. Paulo: I’m in Cape Canaveral for the NASA Juno Tweetup, yet looking at the attendees, I almost feel like I haven’t left the DC region, because a bunch of these people could very well be my neighbors: folks from DC, NoVA, and MD. I’m going to spend my time soaking up the bittersweet wonder of post-shuttle NASA KSC, but also talking to fellow District-area Tweetup participants about life, the universe, and everything concerning how driving around Florida differs from driving inside the Beltway. Alexia: Getting up unreasonably early Saturday morning to head to the Arlington Civitan Flea market! This happens only once a month, and it’s always an adventure, even if I don’t end up buying any treasures! Plus it’s in a multi-deck parking garage, so there’s plenty of shade going on. 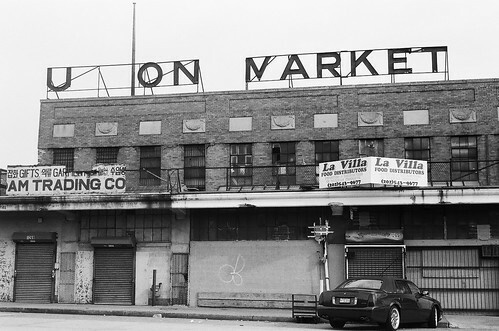 The rest of the day I’ll be in the recording studio, but come night-time I’ll be heading out for some fun, thinking about the H-Street corridor for that. Sunday I have orientation most of the day for Girls Rock! DC Camp. I’ll be a band coach for camp all next week! So psyched! (There will be a showcase of the girl’s bands/DJ sets next weekend, so I’ll be mentioning that next week!) In the evening I’ll be heading over to Shirlington for dinner (probably Busboys and Poets) and to catch the new Miranda July movie “The Future”.